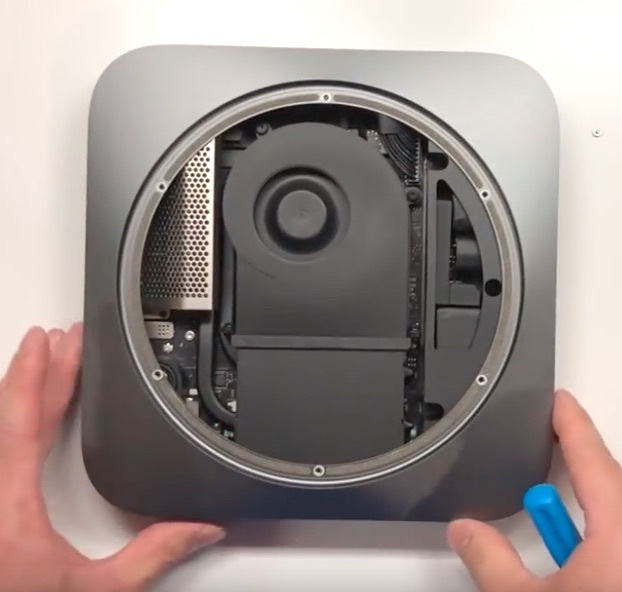 Start by examining the above image that was supplied by Apple, and which graces Apple&apos;s marketing information about the Late 2018 Mac Mini. Notice that it looks trivially easy to open the bottom and slip out the memory sticks. At least two videos are available on YouTube showing the actual upgrade process. The two videos I found are embedded below, and they show a very different picture. Yes the memory can be changed, but the process is not by any stretch of the imagination simple. What follows is the documentary evidence of how difficult the process is. Bottom line is that Apple&apos;s marketing literature is lying when it implies swapping the memory sticks is easy. It is an involved process -- that is unnecessarily complex. As I wrote in an earlier posting the Intel NUC series is an excellent implementation of the same sort of computer. Both the NUC and the Mac Mini are examples of very small desktop computers running at very low power consumption while offering tremendous computational performance. They rely on using laptop parts to build a desktop computer, and the Intel NUC is by all measures an excellent computer. To disassemble the Intel NUC and replace any component is trivially easy. You open the bottom using easily accessible standard screws, and every part is easily accessible and easy to swap out. As I&apos;ve said before, Apple should be embarrassed over the Mac Mini. Immediately on removing the bottom cover you&apos;re shown this. If you review the upgrade process of the 2014 Mac Mini, this is familiar. At this point your action is to remove the metal plate. There are some fiddly bits about doing so, and you should watch the videos below to see instructions. With the plate removed we can see the innards are quite different than what Apple showed us. There&apos;s a big fan, and the memory sticks are not visible. And here we have the key image. The fan has been removed and we can more clearly see the innards. But, are the memory sticks easily removable? Nope. The memory sticks are under the metal shield at the right. 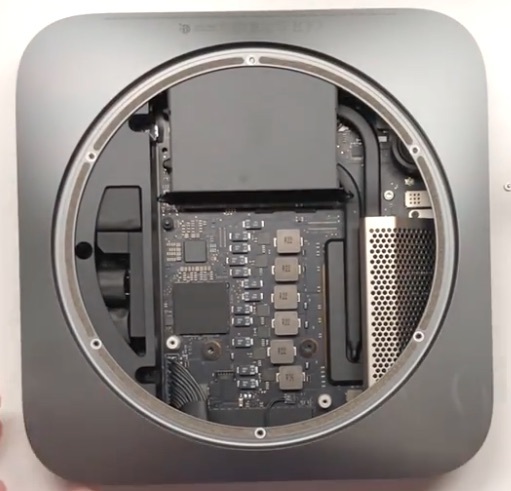 As you can see in the embedded videos, it&apos;s not possible to remove the metal shield while the logic board is inside the Mac Mini. This could not be more different from what Apple showed us in the marketing literature. At that point you can finally swap the memory sticks. 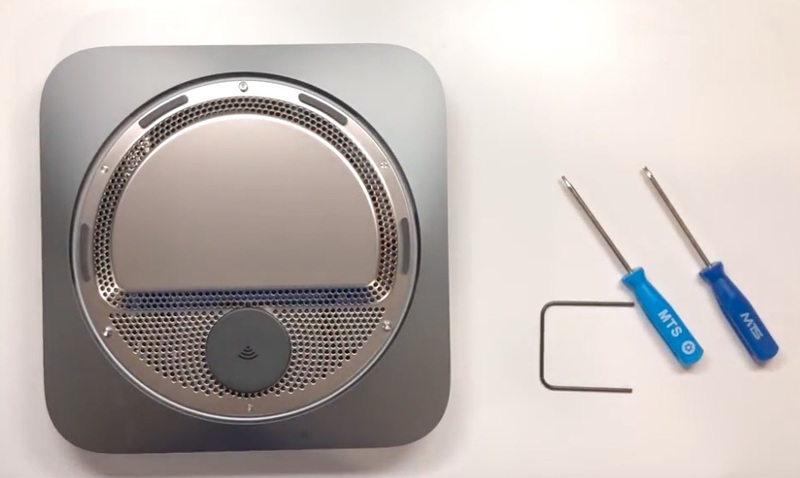 And then go through the rigamarole of reassembling the Mac Mini.